This was the fourth in the Shopaholic series. 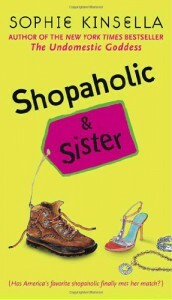 Of all the Shopaholic books, this is my favourite so far. This one has a little more depth to it than the previous ones did, and I feel like Jess's character added a really fantastic foil to the book. Jess is revealed to be Becky's half-sister, and as such Becky is absolutely ecstatic to gain another best friend, especially as her old friend Suze has recently made another close friend. I am much more similar to Jess, who was frugal, stoic at times, and rather academic, than I am to the flamboyant Becky, and in a lot of ways I felt like Jess was coming and giving Becky the slap in the face that I've been wanting to give her through the last three books. This book said a lot about friendship and the power that the people around us can have. As again it could probably stand alone with ease, this would be a great book for someone looking for a fun read with less romance.